The HTC Desire L snuck out of the Taiwanese manufacturer over the weekend as the firm looks to bolster its mid-range offerings. Packing a 4.3-inch display, 5MP camera, 1GHz dual-core processor, 1GB of RAM, 4GB of internal storage, microSD slot and 1,800mAh battery it looks set to go head-to-head with the Windows Phone 8 toting Nokia Lumia 720. The Desire L comes running Android Jelly Bean (version 4.1.2), weighs in at a comfortable 118g and measures 128 x 66.9 x 8.9 mm. In terms of design, the Desire L follows in the footsteps of the Taiwanese firm's latest smartphones with a smooth, unfussy finish. 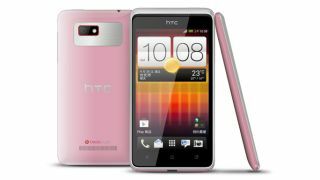 You'll be able to pick up a HTC Desire L in black, white or an interesting faded-pink hue - if you're lucky enough to be in Taiwan that is, with a global release date currently unknown. It's not clear if the Desire L will make it to the likes of the UK, US and Australia after a company spokesperson told TechRadar "HTC doesn't comment on future roadmaps for devices".